An overview of what a preference centre is used for? How do unsubscribes work in CommuniGator as standard? As part of any standard CommuniGator setup, every customer will have a standard global unsubscribe which completely unsubscribes contacts from all of your email communications. If you are a standalone (no CRM integration) customer, the value used in the unsubscribe rule will be written back to the contact record in CommuniGator. If you are using CRM integration, the unsubscribe value will be written to the contact record in CommuniGator and then passed back to either the lead or contact record in CRM. This method of unsubscribe is referred to as global unsubscribe; once the recipient unsubscribes, they have chosen to opt out of all future email communications. This action is automated and takes place with immediate effect. The contact wishing to unsubscribe is taken through two landing zone pages, ‘are you sure’ and ‘confirmation.’ Both of these pages can be styled and branded to your own needs. Why use a preference centre? Who does it benefit and why? So why opt for the preference centre approach? Simple: Retention, retention, retention. By using a preference centre, you give your audience the chance to select the types of communication they would like to receive from you, enabling them to tailor their desired email communications. 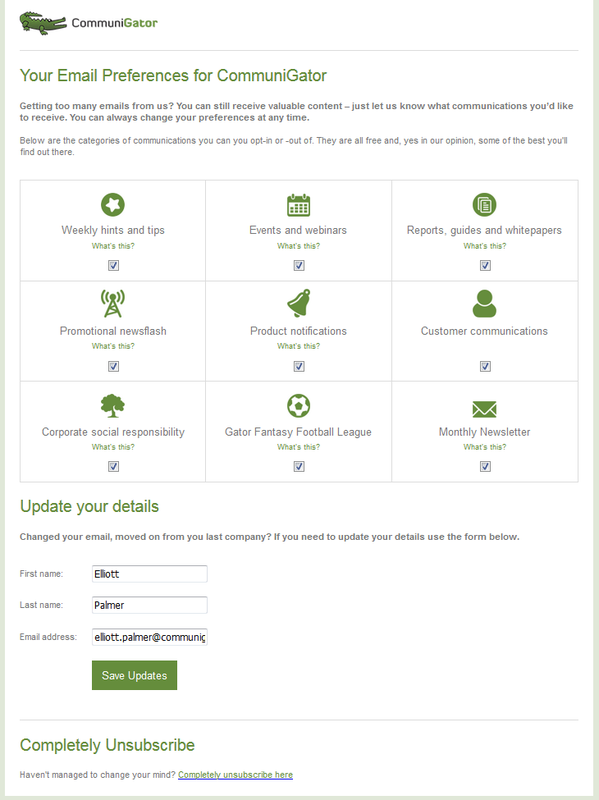 The options can range from opting in and out of event-based communications, standard newsletters, hints & tips, product updates, alerts and many more. Once the preference centre has been set up the process is completely automated; it can be used in a standalone environment or integrated to CRM. Both methods will update your contact records in CommuniGator, and - if you are CRM integrated - your leads and contacts too. When it comes to deciding what options to give your audience, you will need to look at your marketing sends as a whole and see how the numbers stack up. The preference centre is designed to give your contacts more choice, not overwhelm the recipient with too many options. If you send many different types of email communications, we would look to see if these could be put in to categories to reduce the number of preferences on the page, making it easier for your contacts to pick and choose. Once the preference centre is created, you can set it as a system default, making it standard for all campaigns you send. Multiple preference centres are possible, but rarely required. CommuniGator uses the group builder to make up groups of contacts that have opted in for the preferences specified by the preference centre, allowing us to ensure that the recipients will only receive what they have opted into! We also use the standard global unsubscribe as a safety net in case the recipient decides to opt out of all communications on the main preference page. If this option is selected, the recipient is directed to the ‘confirmation’ landing zone page and is informed that they have been removed from all future mailings, unless they decided to opt back in. This is all achieved by using a mixture of the unsubscribe rule, landing zones, web capture and groups. The preference centre itself is controlled by the unsubscribe rule that is made up of two landing zone pages, ‘are you sure’ (the preference page) and ‘confirmation’, both of which can be styled and branded in the same way as the standard unsubscribe. Please see the example below of our very own!